Russia has been criticized by western leaders for its “destabilizing” influence on the crisis in Ukraine, at the start of a NATO summit in Wales. NATO and the UK warned that pressure on Russia would be increased if it did not change course in eastern Ukraine. Prior to the summit, Ukraine’s President Petro Poroshenko briefed US and EU leaders on earlier discussions on a cease-fire plan with Russian President Vladimir Putin. Some 2,600 people have died in fighting between Ukrainian troops and rebels. The West says it has evidence that Vladimir Putin is supporting the separatists with training and arms, and has sent Russian troops across the border. Russia denies the accusation. The conflict has forced more than a million people from their homes in eastern Ukraine, according to the UN estimates. Ukrainian government forces have recently suffered several losses, after rebels launched offensives in both the Luhansk and Donetsk regions, and further south around the city of Mariupol on the Azov Sea. Reports are emerging that the separatists have begun shelling the outer defenses of Mariupol. At least two military vehicles were seen on fire in the area, and eyewitnesses spoke of gunfire. In a separate development, President Petro Poroshenko said “the implementation” of his peace plan – which includes a bilateral cease-fire – could start on September 5. Petro Poroshenko said this depended on planned talks in Minsk between representatives of Ukraine, Russia, the pro-Russian rebels and the Organization for Security and Co-operation in Europe (OSCE). During the two-days of talks, NATO leaders are also set to discuss the rise of Islamic State (ISIS), and Afghanistan where Taliban militants launched a deadly attack on a government compound on September 4. 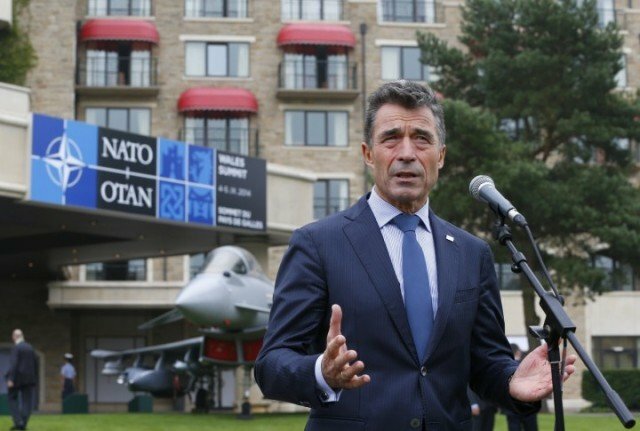 Earlier today, NATO Secretary-General Anders Fogh Rasmussen said the summit was taking place in a “dramatically changed security environment”, with Russia “attacking Ukraine”. “We are still witnessing unfortunately Russian involvement in destabilizing the situation in eastern Ukraine,” he told journalists in Newport ahead of the summit’s official launch. Correspondents say the summit is NATO’s most important for decades, as leaders faced the question of whether the alliance is equipped to deal with 21st Century challenges. NATO is expected to approve plans to create a rapid response force composed of several thousand troops from member states, able to deploy within 48 hours. European leaders are also set to discuss a new round of tougher economic measures against Russia.